Negative feedback? Declining sea ice to lead to cloudier Arctic | Watts Up With That? Composite image. Data from MODIS. Credit: National Snow and Ice Data Center. Arctic sea ice has been declining over the past several decades as global climate has warmed. In fact, sea ice has declined more quickly than many models predicted, indicating that climate models may not be correctly representing some processes controlling sea ice. One source of uncertainty in models is feedback from cloud cover. Sea ice can affect cloud cover, as melting sea ice and increased evaporation from the ocean surface can lead to more cloud formation. In the Arctic, clouds have an overall warming effect on the surface, so greater cloudiness in this region could lead to even more sea-ice melt. Liu et al. 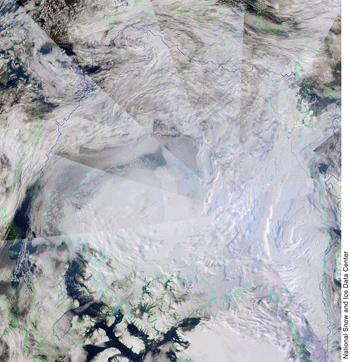 analyzed satellite observations of cloud cover and sea ice from 2000 to 2010 to evaluate feedbacks between sea ice and cloud cover. They find that a 1 percent decrease in sea ice concentration leads to a 0.36–0.47 percent increase in cloud cover, and that 22–34 percent of variance in cloud cover can be explained by changes in sea ice. So as sea ice declines, the researchers predict that the Arctic will become cloudier. Center for Climate Research, University of Wisconsin-Madison, Madison, Wisconsin, USA. Or maybe they are off the mark and a periodic atmospheric circulation change can explain both the sea ice decline and cloud cover change. That would strike a sensible person as perhaps a more rational approach that is internally consistent. As opposed to… trying to find a way to patch up a model by assuming that the model’s underlying assumptions remain correct. 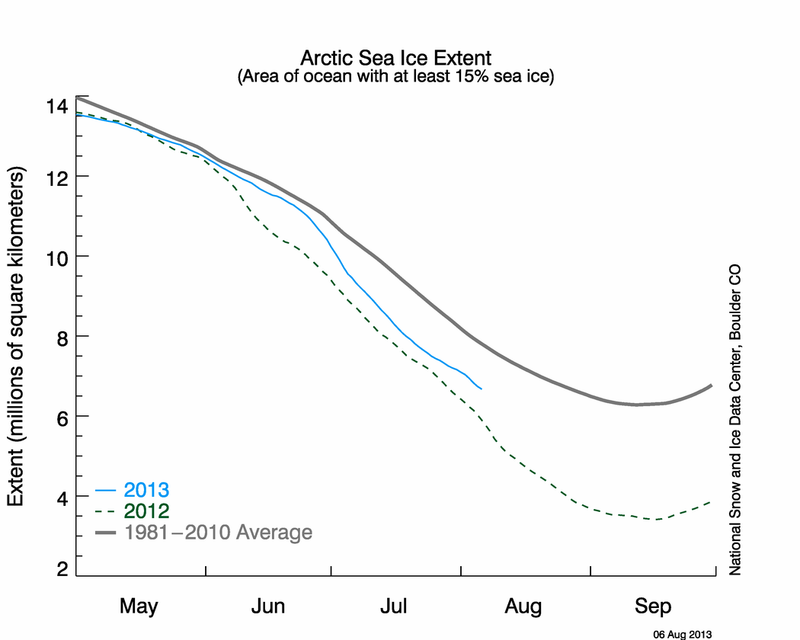 Arctic sea ice has been increasing over the past several years as global climate has cooled. In fact, sea ice has increased more quickly than many models predicted, indicating that climate models may not be correctly representing some processes controlling sea ice. There… Fixed it for ya. They are just looking for patterns much the same as stock market investors do. But what patterns are they looking at as sea ice is NOT in decline? The biggest feedback as far as global warming is concerned is supposed to be the reduced Albedo due to the reduced ice cover. So if clouds are increasing as the ice cover declines, then that will work against the ice-Albedo feedback resulting in something closer to a wash.
And we should note that Ice Albedo feedback is responsible for the -5.0C impact of the ice ages so it is no small measure. These guys should be fired immediately for trying to pass this garbage off as science. A quick check of current Arctic Ice Extent shows we are a mere 2.67% below Average compared to the 30 year average on this date. a tiny 0.381 below a nearly 13.8 Million seasonal high mark. Where exactly does the notion of the decrease ice come from, and how can it be worse than models predicted? they would have had to predict growth to make that an accurate claim. Also, I recall many predictions of Ice Free summers, which we have not seen, and more than likely we will never see. Do these guys have any idea how to use a calculator and NASA provided data? Dave of Commonsense: Sea ice is cyclical. Read up at Real-Science.com. Regular voyages were made through the northwest passage around 1906, in relatively small, unprotected boats. It is generally impossible today unless using huge icebreakers with GPS and satellite video feeds showing where the leads are. The notion that we have reduced sea ice is laughable. Compared to the peak, yes, sometimes. Compared to the trough, not even close. BBC material world today covered Geo engineering and the scientist who advises the whole of the EU is making plans to scatter the top of the world’s atmosphere with reflective particals to make us all colder. (as they see it) says but seemed to think it perfectly OK to cool the Earth down by injecting man made material into the atmosphere. They failed to see the total irony of what they were approving. indicating that climate models may not be correctly representing some processes controlling sea ice. For those whose minds are covered by a cloudy day, . . .
How does the title “Negative Feedback” coincide with the articles content of warmer arctics? Isn’t that positive feedback? More melt leads to more clouds leads to warmth and more melt? Can’t prove or disprove the proposition. U. of Bremen had some years of history to ponder. Michael, are you implying something not correct in my post? Perhaps you mistook my underlying sarcasm for uncertainty . The paper is crap. The Ice is not melting away. Lately I am hearing the arguments about multiyear ice and “ice volume” which are even more laughable than claims of decreased ice extent from cloud cover. There is not a single reliable measure of Arctic Ice Volume anywhere, period. There are some guesses, some calculations, but mostly just warmista crap. And my comment above does not even mention the lack of global warming since 1998, in any and all global databases. Not even the reversal of the warming trend since 2001, to near -0.7°C (-1.26°F) per century. That’s according to HADCRUT3 that passed away without a successor on March 11, 2012. Also, October, November and December 2011 were “warmed” in the 2011 data on that date. HADCRUT4, its succesor, has not been announced. Superficially this looks plausible. But when you are talking about the weather in the Arctic, season cannot be overlooked. The cloud feedback in winter (with no sun at all) is going to be qualitatively very different from the cloud feedback in summer where it is daylight all the time. The article seems only able to reach its conclusions by ignoring this. In winter clouds when clouds are likely to have a more strongly warming effect, nothing much is melting since temperature are well below freezing anyway. In the summer melt season the effect of clouds is more ambiguous and they may even have a cooling effect. Furthermore precipitation (in the form of snow on the sea) aids the formation of pack ice. And all things being equal increased cloud should lead to increased precipitation. The argument attributing melting ice to the presence of clouds only really works by ignoring all these complicating factors and presenting a simplified case. And in any case the effect is likely to be small. The big thing that climate models completely overlook when it comes to ice levels in the arctic is the effect of changing wind patterns and ocean currents on the movement of pack ice. This is the elephant in the room. Cloud feedback effects are dubious and tiny by comparison. BBC material world today covered Geo engineering and the scientist who advises the whole of the EU is making plans to scatter the top of the world’s atmosphere with reflective particals to make us all colder…. Good grief that is just what we need. A lot of Donkeys wasting tax payer money trying to bring on the next Ice Age. Even the Warmers know we are in a dicey point near the end of the Holocene. I wonder what will happen when a “reality feed-back” from nature wakes them up. 1. We can measure sea ice to within 1%? Not! 2. There is a definitive trend in sea ice one way or the other? Not! 3. We can measure cloud cover with tenths of a percentage? Not! 4. There is a definitive trend in cloud cover one way or the other? Not! 5. Did they present one iota of evidence or even a logical thought process showing that one was cause and the other effect? Not! 6. Did they consider that both trends (that they can’t possibly measure to that accuracy) not only may not exist, but may both be effects and that neither are a cause? Not! Was that enough negative feedback? The temperatures in the arctic during the ice melt season have been below normal these past 2 years at least. Clouds don’t always form and stay in situ, the wind carries the clouds south where they could have less warming feedback or turn to negative feedback. The arctic ice is known to have been low in the past, prior to the satellite era. The low anomaly of 2007 was caused by the wind blowing ice out into southern waters. 10 years is a short time to come to any conclusions. Amazing how they manage to completely disregard this type of information. A lot of people will move south in a hurry, only stopping to tar and feather the jokers who were predicting “global warming”. No, I was agreeing with you. Steve Goddard has some great historical info on it at his site, just suggesting you go see it. The sea ice records are a joke. It’s not hard to imagine why… almost nobody lives there, only a few in history were ever able to travel through the arctic and make it out alive to tell their story, even in the best of years, but the fact that they made it at all suggests the ice had to be less than now. The guys who really measured some serious ice melt were the ones in the 1800’s, when some of the glaciers were receding at truly “unprecedented” rates. I’m sure the sea ice during those summers would have been pretty sparse compared to today’s when you’re talking about glacier recession of many miles per year back then (for decades on end). It must have been great fun for the storytellers back then too. I’m sure they had their share of bloviating doomsayers, blaming it all on evil gold prospectors or something. The subject of the Greenland ice sheet came up today at work with the focus being the small lakes that form on the surface and sometimes disappear down a hole rather quickly. I tried but have not found information on the temperature of the water in these ponds relative to the ice temperature. If both are very close to freezing temperature then might these lakes indicate a phase change from a minor temperature change and not so much an historic influx of heat? I guess don’t understand this post. That’s would seem to describe a positive feedback loop. Let me add another “angle” to your point. Scattered clouds won’t block a high percentage of the radiative loss in the winter/night, but they reflect a larger percentage of the incoming sunlight because of the low angle. This difference could be huge if the clouds have significant height. Looking straight up through them, they’d be all gaps, but at a low angle, you couldn’t see through them at all. These two effects could happen simultaneously. The sunlight from only slightly above the horizon can’t get through, while the sky straight up is almost clear. That said, the next step is to look at the derivative of this phenomenon as a function of the marginal cloud density. As we go from no clouds to a few clouds, I’d expect the clouds to cool things. But as the density starts to get high, this effect diminishes. Maybe the original article went into this, instead of just spouting general platitudes. I wonder. That’s according to HADCRUT3 that passed away without a successor on March 11, 2012. Dr Essenhigh has already covered this. Essenhigh’s hypothesis involves the proposition that moisture available for precipitation in the arctic comes from the arctic ocean. I wonder if that’s true? A lot of the discussion on the GRL paper revolves around, or assumes, the sign of the effect of clouds on arctic temperatrures. There is some good stuff on the effect of angle if incicence on this balance but I’m wondering what the radiative temperature of an arctic icepack is? “These guys should be fired immediately for trying to pass this garbage off as science. It is well possible that they are right, and that the big decline in sea ice during 2007 was partially caused by this effect. Obviously we are already back on the way to more sea ice so something has overwhelmed that positive feedback. A system with positive feedbacks develops a hysteresis, so that the opposing influence must first become strong enough to overwhelm that positive feedback to be able to effect a change. Of course, this leads, once the overwhelming happens, to a rapid state toggle. similar to the “ipping point” rethoric of the warmists but like flipping something on and off; not switching from warm to very warm. In other words, I expect ongoing rapid cooling. 2007 was the flip. Err 1958 USS Skate, did not seem foggy in the photos. Clouds are insulators. They keep cold cold and hot hot in the regions below them, but if you are in them they are freezing cold. The paper seems simplistic, but it does get me musing about clouds in the arctic. Clouds require evaporation, and it seems little of the moisture can be “home grown,” because everything is frozen solid up there, right now. Even with the midnight sun just peeking over the horizon at the pole, temperatures remain down around thirty below. (See the DMI “mean temperature above 80 degrees” map on the WUWT “Sea Ice Reference Page.”) Temperatures will not poke slightly above freezing until after May 1, and will dip back below freezing as the sun sinks low around September 1. Therefore most of the year there are no puddles, and little evaporation. Therefore most of the moisture in the clouds up there, during most of the year, is not “home grown,” but rather is “imported” from the south. Therefore the amount of clouds seems to depend on whether you have a positive AO or a negative AO. In the first case the arctic vortex stays tight and cold air is held up in the arctic, and in the second case the jet stream loops south and arctic outbreaks charge far to the south, which allows a sort of back-slosh of warmer air to head north to replace the cold air. For example, this past winter, when the hounds of winter howled south over Europe, Asia and Alaska, warm air was sucked north over eastern Canada. It is only when this warm air heads north that you get much moisture for clouds, during the winter. Oddly, when the warm air pokes up into the arctic, you are likely to get more ice, rather than less. The warm air feeds storms, and rather than an arctic calm you get howling winds. The wind shoves the ice about, piling up pressure ridges and opening wide leads which swiftly freeze over. Where calm allows the ice to act as insulation between the 28 degree F water and the minus-40 degree F air, wind exposes the water to the air, allowing more ice to form. Also more heat is released to make clouds, but also to vanish up into outer space. As I began by saying, the subject is not simple. However it is fascinating, and fun to ponder upon. Be informed: More melt leads to more clouds leads to less warming and less melt. It’s the albedo. Low-level clouds reflect away far more heat than they trap. If they are right, we would see much more cloud in summer when the ice is melting than in winter. Wait a minute, right now global sea ice is only about 0.1 million square kilometers below normal (summing the northern and southern hemisphere anomalies), and this is, statistically, normal and above what we have seen in recent years. How can they claim that the decline in global sea ice is more rapid than predicted? Did the models predict it would be above normal??? That’s the only way I can see that the current conditions could possibly be “worse than we thought”. Also, slightly off topic for this thread, but has anyone ever studied the influence of nearby volcanoes on the CO2 monitor at Mauna Loa that everyone cites as “THE global CO2 monitor”?? As far as I know, for most of the last 26 years, Kilauea has been erupting almost non-stop. Kilauea is pretty close to Mauna Loa, and I would think that a constantly erupting volcano in the vicinity of a CO2 monitor might skew the results higher for some reason…. When are people like “anon” going to have even the most basic understanding of nature? Nature ABHORS positive feedback loops (think of your ears’ reaction to feedback from a microphone/amplifier, your ears don’t like that at all, now do they?). Positive feedback loops in nature would cause natural systems to spiral out of control, thus eventually causing the natural system in question to self-destruct. We have had over 4 billion years of climate change on Earth, and the system has yet to self-destruct, in spite of extreme changes in the system from time to time. Natural systems can be chaotic, and entropy will EVENTUALLY win, but natural systems also tend to be cyclical in nature due to the presence of natural dampeners (negative feedbacks) which keep the system in a rough balance. Sea ice is as healthy as can be. 5) Years of accumulating snow would produce glaciers and ice sheets reflecting sunlight/heat into space and–voila!–an Ice Age! Perhaps Time magazine and Newsweek can recycle their old cover stories. That effect would also happen if cloud cover is complete, but the clouds themselves are thin. When looking straight up, there is little water vapor to interfere with the radiation of heat. However because sunlight is coming in at a low angle, the visible light must pass through an effectively, much thicker cloud layer to reach the surface. Let me add another “angle” to your point. Scattered clouds won’t block a high percentage of the radiative loss in the winter/night, but they reflect a larger percentage of the incoming sunlight because of the low angle. Let me add to that; FLIR (literally translated: “Forward Looking Infra-Red”, as opposed to the original/early belly-scanning downward-looking IR aircraft ‘cameras’) operating in the 8~12um range can see through light overcast … personal observation while aboard company’s Convair 580 flight test bed flying over US-75 in a cloud deck on an equipment checkout-run equipped with an IR pod (we were doing checkout of a nose-mounted Ku band ‘targeting’ RADAR) … looking out the windows at (where) the highway (should be) the traffic could not be seen, looking at the colorized FLIR imagery screen and viola! .. could see the traffic … what this confirms is that ‘light overcast’ is not 100% blocking of LWIR, a fair amount still transmits/transits through said lt ovrcst. In the Arctic, clouds have an overall warming effect on the surface. Might be, but how gut is the evidence for this? And is there a warming effect in summer as well, and how is the seasonal feedback of clouds in the Arctic? How is the seasonal distribution in cloud increase in Arctic? And the ratio continues to move closer to the mean. Fresh numbers now are only 2.41% below Average. I think we need color coding for the Earth’s clouds. I would suggest “red for clouds that warm” and “blue for clouds that cool”. I need a research grant on how to move the red clouds and/or the blue clouds to the appropriate areas. This would solve the global warming/cooling problem. If you don’t give me a grant, I will find a reason why the clouds are moving the wrong way; thereby, in 20 to 10,000 years will definitely cause weather issues. Of course my reason will be supported by data from 100,000 years ago to the present. Give me a grant or I will promote industries that move the red/blue clouds in the “wrong directions.” Do what I say or a dire future will engulf the Earth in violent warming/cooling events; proving my hypothesis. At Thule Airbase, fog only occurs in Summer when Northstar Bay is open water. No. Clouds don’t warm or cool the Arctic in significant ways. Naturally occurring oscillations in oceanic current temperatures and the atmospheric Arctic Oscillation do. In the winter, a warmer cold is still freezing cold. So we can ignore that season. In every season, the warmed or colder current coming into the Arctic was prepped by ENSO factors elsewhere prior to its delivery of said water temperatures at the Arctic’s front and back door. And the melt season is highly correlated to the Arctic Oscillation conditions present at the time. Measuring clouds over the Arctic is like the proverbial search for the stink in a room occupied by an elephant. In reply to DirkH and kbray, if you look at sea ice globally, for example on the WUWT sea ice reference page, the sum of the northern and southern hemisphere sea ice anomalies is now slightly positive, meaning that globally sea ice is basically right at normal (just a tick above, but statistically right at normal). Am I the only one not impressed that only 22-34% of the variance in cloud cover is accounted for by changes in sea ice? Call me back when they get up to 85-95%. In the Arctic, clouds have an overall warming effect on the surface, so greater cloudiness in this region could lead to even more sea-ice melt. So decreasing sea ice leads to increased cloudiness, leads to higher albedo, leads to global cooling. Actually, measurments by satellites in the Arctic show that a reduction of low cloud cover occured at tthe same time as the decrease in summer sea ice accelerated. Likely, this reduction in cloud cover is the main reason of the extra decrease in sea ice during the summer. Perhaps that’s why his vehicle fell through the ice and had to be towed out? He only made it to 78º36’N too, a good job he didn’t attempt 90ºN. So what is the overall effect of clouds outside the Arctic? And even more recent numbers show only 1.66% below Average. This Arctic Sea Ice Area Mean indicator is 98.34% of Average mean. Can climate have a positive feedback mechanism? This is one question that climate scientist have always avoided addressing. If there was a positive feedback mechanism no matter how tiny, then a higher level of CO2 in the past has to have resulted in temperatures rising to the high limit condition before falling again. Since we know this is not the case the dominant variables must have a negative feedback characteristic which either means CO2 is a trivial variable and irrelevant or that the models have been based on an abnormal period and are fundamentally unsound. The have used hindcasting in deriving the models which is a no go for true professionals but having made that mistake they have not verified the resulting models at random intervals over all known period data. The matches outside the last fifty years are between poor an a disgrace. I also fail to understand their obsession with linear trends when it is clear that almost all the major factors are cyclical and hence sinusoidal so the only meaningful analysts possible should be based on Fourier series. Can anyone point me to any computer model that actually even attempts to model in detail the Co2 production and use in nature without which all the models are just garbage. There has first to be proof that CO2 cycle does not just stabilise at a variable level or cyclical pattern according to an unknown mechanism, even with a human input ten thousand times ours for the science to be even considered probably correct let alone proven. Sea ice is cyclical. Read up at Real-Science.com. Regular voyages were made through the northwest passage around 1906, in relatively small, unprotected boats. It is generally impossible today unless using huge icebreakers with GPS and satellite video feeds showing where the leads are. Regular voyages were made through the NW Passage in 1906? No, ONE was *completed* in 1906. Roald Amundsen traversed the passage in a *three year* journey, finishing in 1906. Since 2007 both the NE and NW passages have been open for extended periods and *now* regular voyages are made by ships, yachts, and all manner of vessels. Michael Smith has everything bass ackwards. You seem to be fixated on the current sea ice extent being close to normal, as if this portends a recovery. This is not an indicator of what will happen at the low point in the summertime. If you look at the sea ice graph below, you cans see that the current extent is similar to 2010 at this time, but the 2010 minimum extent was 4th lowest in the summertime behind 2007, 2009 and 2011. Since there is very little multi year ice, a quick melt is likely based on recent data. “When are people like “anon” going to have even the most basic understanding of nature? This is wrong. A positive feedback mechanism multiplies the response resulting from the forcing factor by a constant factor, for a linear response. There is no extrinsic high limit condition involved. Your logic, facts, and definition of positive feedback are totally wrong. We will see where we are at the end of the season. I anticipate an improvement in the minimums.